Kids grow incredibly quickly making it hard to maintain a safe, stylish and suitable wardrobe. One of the biggest areas of expense for parents is shoes. Just when you think you’ve nailed it; you’ve found them the perfect pair of shoes that are safe for them to run in and look super cute with all their outfits, suddenly another growth spurt occurs. Chances are your kids have already outgrown the shoes you bought them when they were a toddler. Dragging a kid around the mall to find a new pair of shoes is not the ideal way to spend your days off. Children with flat feet may benefit from specially designed kids shoes for flatter feet. View the Best Kids Shoes, Below. What Season they’re Designed For? What kind of Sole they Have? How to Teach Kids to tie Their Shoes? How to Organize Kids Shoes? How to size kids Shoes? Luckily, there are so many options for parents, and a lot of them don’t require you to even leave the house to order! We have scoured the internet to find the ten best kid shoes to suit all your little one’s needs and outfits. From one of the best sneaker brands, Baby Jazz are easy-to-wear and designed for active kids. Saucony Kids is a brand that has been specially designed for children’s activities. Their sneakers are made for running, jumping, climbing and any other adventure your little one will embark on. These sneakers are made for toddlers and are lightweight. This not only makes it easy for you to put them on your child, but they’re also supportive for their growing feet. The hook and loop closure is an excellent alternative to laces and is simple enough for your child to learn how to use. It is also adjustable to keep up with their growth. The Baby Jazz Sneakers are made from suede and mesh on the outer layers, which is stylish and durable. The outsole is made from rubber which is comfortable to wear and is tough enough to keep up with all their activities. The large color range is adorable and suitable for any child or outfit! 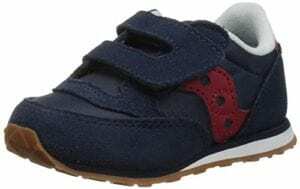 These sneakers have been specially designed for growing children, so they are super durable, comfortable and stylish. These Rain Boot s are adorable over-the-ankle shoes designed for play in the rain or snow. If you have a little or a big kid who loves nothing more than running around in puddles, then these stylish booties are what you need. They are available in three cute colors – brown, navy and pink – making them suitable for your child no matter their gender or developing style. The boots are 100% synthetic rubber, which is why they are so suitable for wet weather. They will prevent your kid’s feet from getting wet or cold and can be wiped clean. The rubber-lugged outsole is non-marking, meaning these boots will maintain their high-quality appearance for longer. The outsole also keeps your kid's feet dry, even in the worst weather. 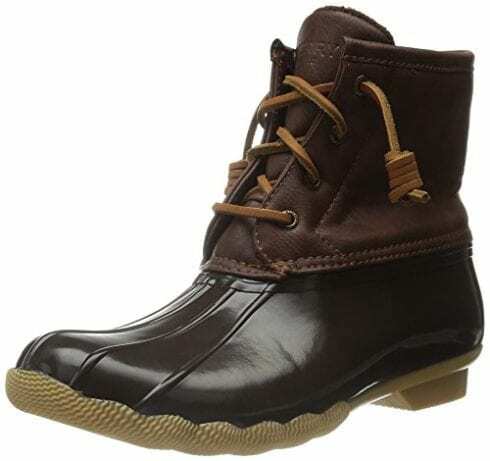 Sperry shoes are a brand that was first founded in 1935 and are designed for adventurers. These kid boots, like the rest of the brand, are made for explorers who wander oceans, lakes and rocky terrains. From a specialist brand, these boots are certain to keep your kid's feet warm and dry no matter the weather. These stylish snow boots are the perfect accessory for your little fashionista. They are available in a range of trendy colors, including varying shades of pink and brown as well as chic, classic black. All boots come with a faux-fur outsole that will keep your little one's feet warm as well as adding to their style. The Femizee Warm Winter boots are one of the most popular shoes for kids during the winter months due to their style and durability. The stylish color range makes these boots a wonderful gift for both young girls and boys. The faux-fur lining makes these boots super warm and cozy so they can be worn all day long in the winter. The rubber sole makes them suitable for wet or cold weather, and they are durable enough to withstand harsh conditions. The main attraction to these boots is how trendy they are. For budding fashionistas, of all genders, these boots would look super cute and actually work to keep small feet warm. These winter boots are super cute and ideal for budding fashionistas, and they work to keep feet warm. The Kid’s Frosty Winter Snow Boot has been specially designed for minimal fuss and maximum winter fun. These boots are a combination of simplicity and style. They are incredibly functional and will keep your little ones’ feet warm, dry and cozy while playing in the snow. They are also easy-to-wear, making them suitable for small and big kids. The traction rubber outsole is durable, lightweight and ensures good abrasion resistance in snowy, ice and cold conditions. 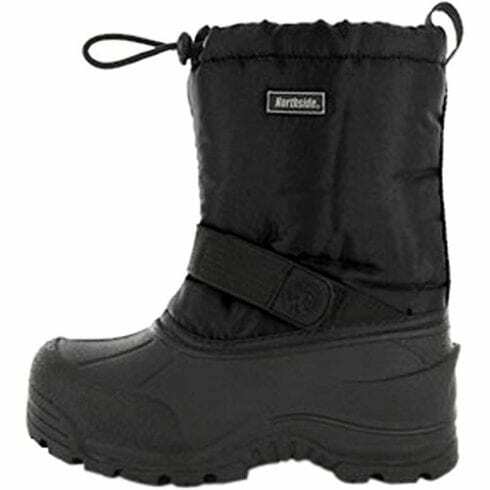 These boots are effective at keeping little feet warm due to the 200grams of Thinsulate insulation. This is a lightweight and comfortable material that is designed to maintain high temperatures. The lightweight waterproof shell is designed for comfortable wearing and will keep water, ice, and snow from penetrating the boot. The great range of colors and patterns makes these boots suitable for all children, regardless of their age or gender. If you want to keep your kids safe, warm and comfortable during the winter seasons, then you need these boots. These snow boots have been specially designed to keep little feet warm, dry, and stable in even the toughest conditions. These waterproof slip-on sneakers are stylish and highly durable. They are made from PETA-approved vegan rubber that is odor-resistant and shock absorbent. These shoes can be worn in the summer or on rainy days, due to the rubber sole and traction it provides. The classic design of the pull-on sneaker is one that can be enjoyed by all the family - the brand offers both children and adults sizes. There is also a great range of colors including bright shades such as red, blue, pink, and orange as well as more neutral tones. They are a lightweight and waterproof sneaker that is comfortable to wear, even on growing feet. The sneakers are breathable which makes them suitable for long-term wear. The classic style is given a modern twist in the slip-on design, making them a sneaker you and your kids can wear for years to come. These classic sneakers are incredibly stylish and can be worn by the whole family. Converse High Tops are one of the most iconic shoes on the market. Their simple and retro design has been loved by adults and kids alike for decades. They are made from a breathable fabric, making them incredibly comfortable for little feet to wear all day long in most seasons. There is an excellent range of colors available, and in some cases, patterns can be chosen. There is going to be a Converse sneaker out there for your little one, no matter their gender or budding sense of style. 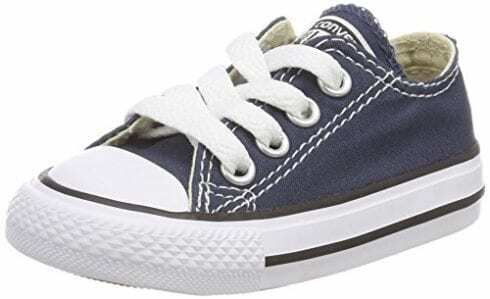 Converse sneakers have a vulcanized rubber sole that has great traction and can support running, jumping, skipping or any other movement your kid chooses. This brand is famous for their simple and timeless design. Your kids are sure to feel too cool for school in their sneakers. Converse All Star s are available in a range of sizes, and there are even baby versions available. 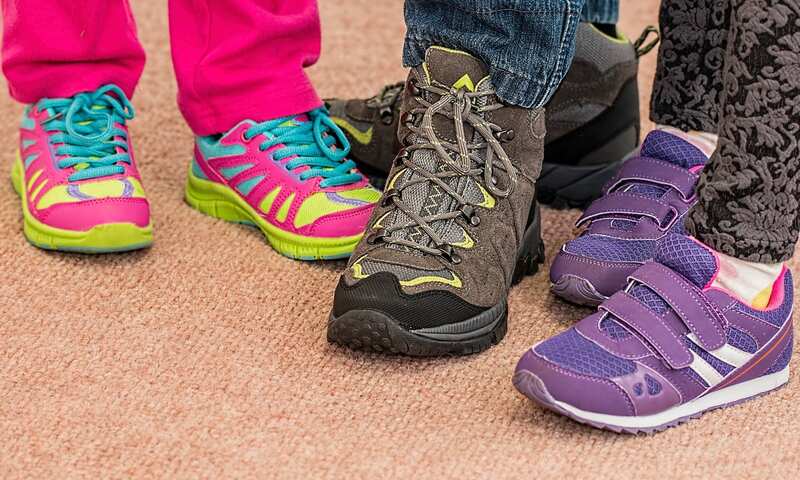 The whole family can have matching sneakers for your next adventure. Converse All-Stars are perhaps the most iconic sneakers on the market, and any child would love their own pair. These rain boots have been designed specifically for small children. The reinforced handles make for an easy-on and easy-off style, which will encourage kids to learn how to dress themselves. The handles are also easy for transportation and are easy for parents to grab on the way to the park or schoolyard. The L ONECONE Rain Boots come in a wide range of child-friendly patterns, to make each purchase specialized to your little one's tastes. They are suitable for both girls and boys. 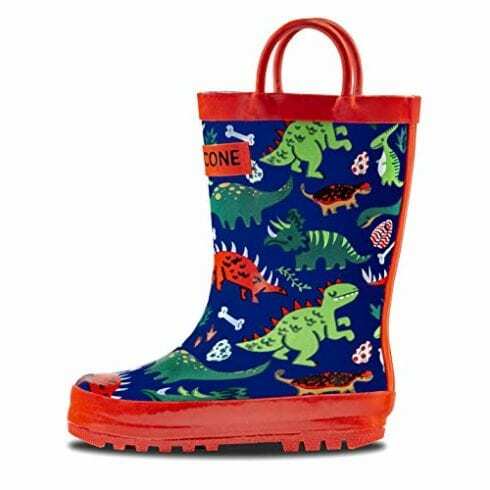 All materials are BPA-free, making these rain boots super safe and durable. The soft, flexible rubber is play-proof and has been designed to withstand vigorous play and activity. These boots have literally been put to the test – they have been tested to withstand 100 hours of playtime without splitting or leaking at the seams. The durable rubber and easy grab handles mean you and your little one will be prepared for anything. These boots are great to keep on hand all year round, as they can handle any weather conditions. These rain boots are incredibly comfortable, flexible and durable - they have literally been put to the test and are certain to withstand your little one’s explorations. Croc’s iconic clog shoes are incredibly popular with families due to how comfortable and durable they are. The clogs are easy to put on, waterproof and incredibly comfortable for children and adults alike. They can be worn as water shoes, to keep little feet safe during trips to the beach or lake, or simply on a daily basis. 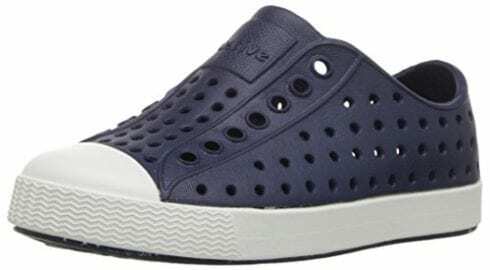 The Classic Clog has been specially designed using fully molded Crocs Croslite material for maximum comfort. The clogs feature ventilation ports for breathability, as well as helping water flow. The clogs come with a heel strap that can keep kids feet secure in the shoe, but this can also be adjusted for easy slip-on action. The Classic Clogs are available in a wide range of sizes and colors to suit any child at any age. They can be worn as house slippers, as well as for outdoor wear. 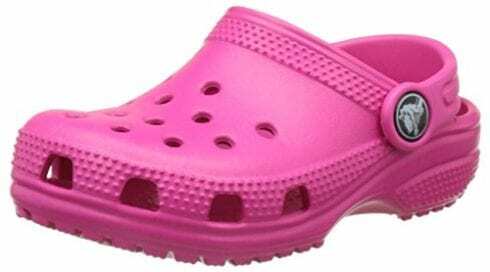 Crocs are the ideal kid's shoe due to how comfortable they are and how easy they are to wear. Children can learn how to put on their shoes independently with the slip-on design. Crocs are a well-loved family brand due to their comfortable and versatile clogs. These NIKE Slide Sandals have a textile outsole and a rubber base for maximum comfort. The Solarsoft foam footbed is incredibly comfortable and secure to wear. It will mold to your little one’s feet for a plush feel. The soft synthetic strap can be adjusted to suit growing feet and moves naturally with them when worn. This makes this slider suitable for growing kids and their action-packed events. These sandals are available in a range of colors and patterns to suit any child, regardless of their age or gender. They are a versatile shoe that can be worn all day comfortably. They can be worn as house slippers or while out and about with the family. Adult versions are available if your little one wants to be like their mom or dad. Sliders are an incredibly trendy shoe at the moment, and everyone is wearing them. Your kid will feel super cool and will look bang on trend with these NIKE sports sandals. These Athletic Sandals are incredibly comfortable and fashionable, making them ideal for growing kids. These adorable kid sneakers are designed for movement. The comfortable, durable and flexible rubber sole can handle all kinds of action, including running and jumping. The injection-molded EVA midsole is very comfortable and is designed to support growing feet while on-the-go. These sneakers are incredibly versatile shoes that can be worn for their style and comfort, as well as their sporting abilities. 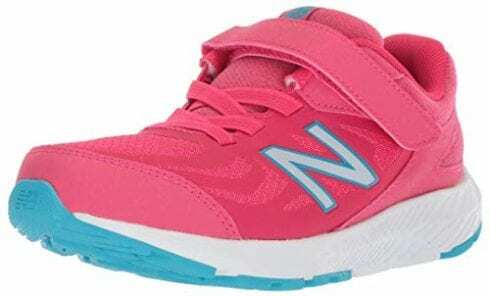 New Balance is a great, high-quality running shoe brand and these kids sneakers follow the iconic seam-free design. 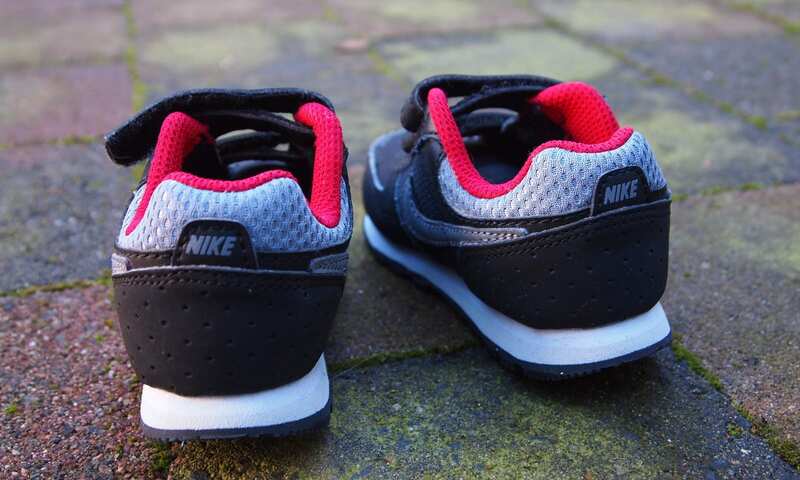 The sneakers are made to last, making them great for energetic children. They are available in a wide range of sizes for big and little kids. The broad color scheme ensures that there is a Hook and Loop Sneaker out there for your child, no matter their age, gender or taste. The hook and loop design is easy for adults to pull on their kid's feet, even when in a hurry. It is simple enough for children to learn and will contribute to their developing independence. These adorable sneakers are designed for growing feet and aids movement. Buying shoes for your kids can be super tricky and unnecessarily expensive. By the time you’ve chosen the perfect sneakers, rain boots or winterwear for your little one they’ve probably grown out of them. Choosing the best shoes for your kids doesn’t have to be this stressful. The wide range of season-specific and activity designed shoes recommended throughout this review can make such a difference to your kid’s wardrobe, without damaging your bank balance. A lot of kids shoes are made from synthetic rubber or textile that can actually grow alongside them. Often the rule is, the more flexible the fabric, the longer the shoes will last you. Some kids shoes have been specially designed for certain seasons, such as the NIKE Kids’ Kawa Slide Athletic Sandal which are great for summer, or the Northside Frosty Winter Snow Boot for winter. 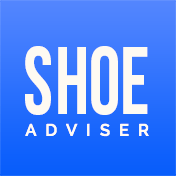 Although these shoes are great for the weather, they’re made for, if you want to save money and make the best purchase for your kid then choose shoes that can be worn in all weathers or conditions. A lot of kids shoes have a flexible rubber sole that has been designed to withstand activity. You want to choose shoes for your kids that support their growing feet and allows them to run, jump or skip whenever they want. Look for shoes that have foam or rubber soles, as most shoes throughout this review do that will be comfortable no matter what activity your kid is doing. Although most kids shoes are designed to be easily worn, you cannot avoid laces forever. The easiest way to teach your little one how to tie their own shoes is to use the bunny method. Parents across the nation have used the bunny face to encourage and teach their kids how to put on their own shoes. Remember to be patient with your child and try to make tying shoes laces a game that they will want to try. You can design your own shoe organizer or purchase something suitable for your home from online outlets. You can measure your kids for shoes at home with a ruler and pen. Simply lay your kids feet on a piece of paper and measure the distance between their toes and the back of the heel. The inches can be taken to a shoe store and converted into a shoe size. Most kids shoes offer sizes in both inches and numbers. Shoes are often a vital trope in children’s fairy stories. Think about Cinderella and The Wizard Of Oz. Use a bunny face to teach your kids to tie laces – this will make learning fun and imaginative. We hope you enjoyed our article on "10 Best Kids Shoes in 2019", if so, please share and rate it.